Stocks are higher in response to global headlines and strength seen in overseas trading. Given the extremely low holiday volume on Friday, a technical follow-through-day seems plausible if the indexes close with 1.25%+ gains. Of course we should be suspicious of any follow-through-day that takes advantage of a holiday comparison. A more reliable benchmark is Thursday’s volume or the 50-day average volume. But as I write this, the markets have given up 1/2 of the early morning gains as the euro is plunging against the dollar. Part of the headwind equities are facing is the inverse relationship between the strength of the US dollar and the US stock markets. Weak dollar = strong stock prices, strong dollar = weak markets. Much of this relationship occurs because most companies in the indexes derive a large portion of their sales and profits from overseas. When foreign currencies are weak relative to the US dollar, those overseas revenues and earnings lose value, lowering a domestic company’s profits, and thus valuation. In addition, a strong dollar means domestically produced products and services become more expensive in foreign countries and those higher prices put further pressure on international sales and earnings. Given how close this relationship has been, the US dollar is worth keeping an eye on as part of your market routine. No doubt a lot of bears are running for cover as today’s price action broke above recent trading highs. Many of the late bears who shorted the market long after the decline was obvious are feeling a lot of pain as most of their positions are in the red. To stop the bleeding, they are buying back their positions, contributing to this move higher as part of a classic short squeeze. Now the question is if there will be follow-on buying from value investors after the temporary lift from the short squeeze dissipates. 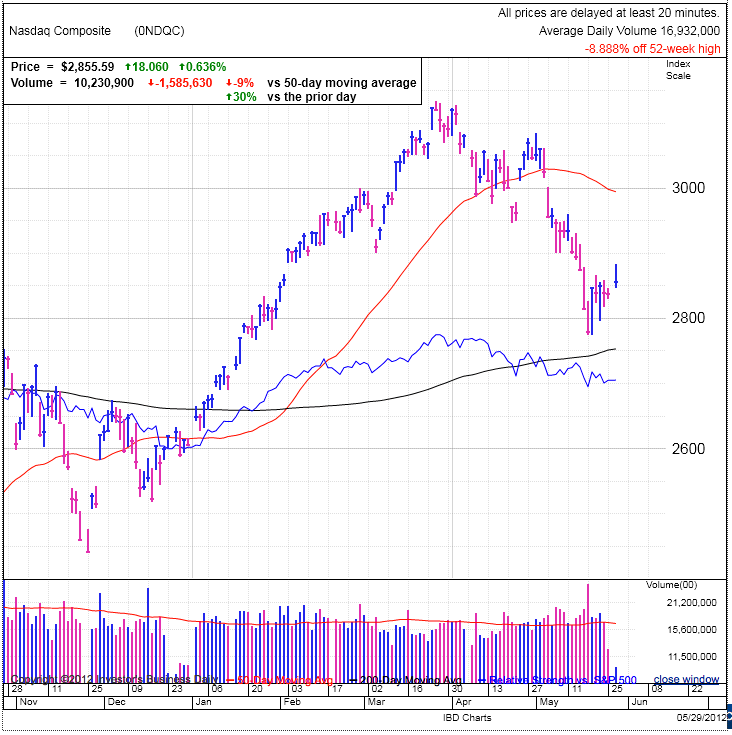 To continue rallying from here, the market will need to conclude the reasons for the recent sell-off were unjustified. That means getting over our renewed fear of headlines. What are the chances of that happening over the next several days? And late morning trade gave back many of those early gains, showing not many traders were eager to follow the short squeeze. But while I don’t see a lot of reason for us to sustain a rally from here, the downside risk is equally suspicious. As we find ourselves in a headline obsessed market, the thing to remember is we can safely ignore what everyone is talking about because it is already priced in the market. The markets are the most efficient discounter of information ever conceived. As soon as a material number of people become are afraid of a Greek default or a Euro breakup, they either immediately sell their positions that would be affected, or lower the price they would be willing to pay for those vulnerable assets. This shift in sentiment moves markets prices to the exact point where there is just as much optimism as pessimism and the scales are perfectly balanced. Existing fears or hopes cannot drive the market because they are already priced in. It takes chances in expectations to move markets as traders change their mind and either bid up or sell assets to reflect their new expectations of the future. I expect we’ll continue to trading in this range as the market sorts through its feelings toward the economy in the US, Europe, and China. From here it will take a material shift in sentiment either due to new information or fatigue over the same fatalistic headlines failing to crash the market (ie Chicken Little effect). The stock market is one of the few places in the world where people are excited for the opportunity to buy merchandise at inflated prices and turn their nose up at buying anything at a discount. You don’t need to look any further than FB to see this phenomena. Two-weeks ago people were excited for the opportunity to buy FB at $45. Yet here we are just a few days later and what was a screaming buy at $45 is now an untouchable pariah at $29. What gives? It is the exact same company with the exact same balance sheet and future as it had two-weeks ago, yet it went from being a must have stock to a complete embarrassment that no one is willing to admit to owning. This is a perfect example of clustering. People’s views on FB are based entirely on what other people think, namely the aggregate’s view as reflected in the stock price. When the group likes a stock, they bid up the price and everyone loves it. When the price falls, everyone hates it. But the thing to remember is the more people who end up clustered around a single view, the less independence and balance there is in the market and the more likely the price will make a big move in the opposite direction. We saw this when FB was the must have stock and was bid up to a $100b valuation and we are now seeing the pendulum swing the other way as FB is the laughing-stock of the market with its $60b market cap. FB continues to get pounded today as it sliced through $30 with the initiation of options trading today. But this shouldn’t surprise anyone as it continues to shakeout irrationally euphoric bulls. 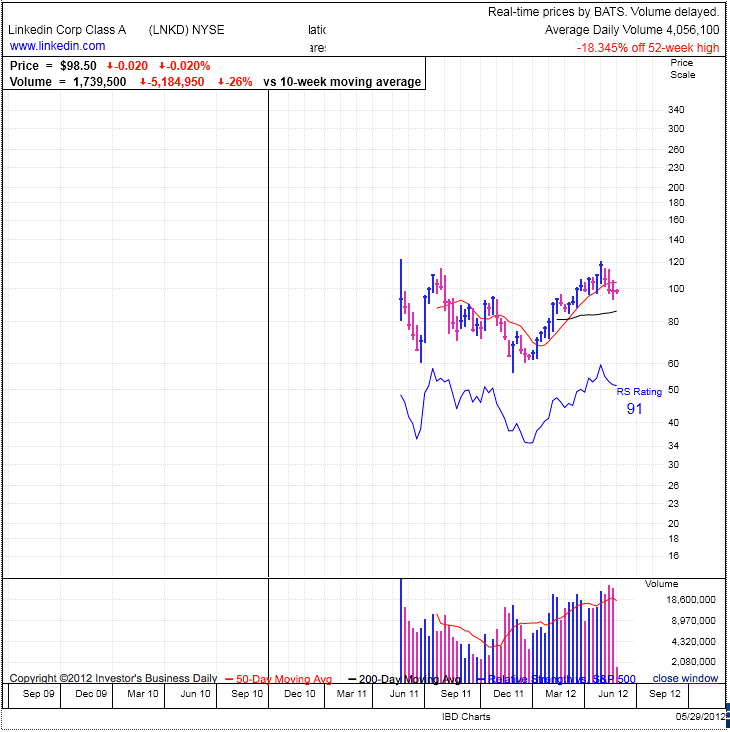 Using GRPN and LNKD as benchmarks, both traded lower for 4-5 weeks before bouncing higher. We should expect to see something similar with FB before it bounces. For swing traders, we want the stock bottom before buying because anything else is trying to catch a falling knife. Day traders who watch each tick of the day can get away with trading short-term moves as they jump in and out of a stock over a period of hours, but the rest of us would be better served by waiting for the stock to bottom and rebound first. Anyone contemplating a trade on FB, keep your price target under $38 because of all the regretful IPO buyers who are praying to the stock market gods so they can get out of their bonehead trade without losing money. This selling pressure at the IPO price will create a headwind for the stock, slowing further gains. But for the breakout trader, seeing a high-volume break above the $38 level would make for an interesting buying opportunity. Remember this is an advanced trade and most would be better served waiting for a follow-through-day and buying more traditional CAN SLIM stocks showing the strongest fundamentals and charts.